Time for an update on what has happened since I broke my wrist in a mountain bike accident on January 9th this year. 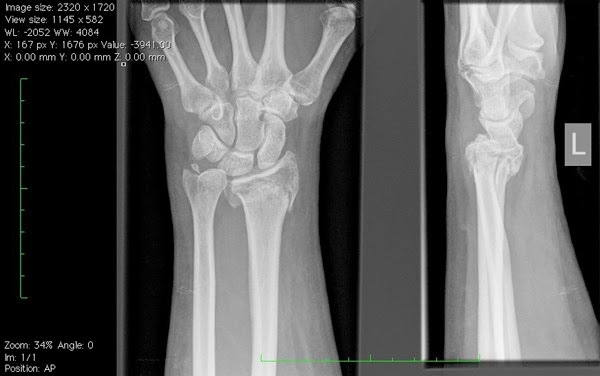 So far I’ve written about the accident itself, updated the critical care a week later and also about coping with the injury (impacted intra-articular fracture of left distal radius with ulnar styloid fracture) and what can be done to manage it. Now I find myself at the next step, rehabilitation. Last week I returned the the Fracture Clinic at North Shore Hospital and had my cast removed, I also had an x-ray and a consultation with a surgeon, which I’ll come to, but first I want to explain what happens when they remove the cast, as it’s a little unsettling. The cast is cut in half with a vibrating blade, that cuts the plaster, but would not cut your skin. As my cast had been on for a day shy of six weeks, the best description I have for my newly exposed arm is this; visually it’s very pale, sensation wise, it feels very distant and finally it smells… smells rather nasty, do not be tempted to keep the cast as a memento. To have the x-ray you can see above, they removed the cast and I’ll be honest, it was quite disturbing. I’ve just spent many weeks carrying around my damaged arm and my last memory of it was being all wobbly-wibbly. I could not move it and I just freaked out as the kind radiographer positioned my arm. Back to the waiting room until the surgeon called my name, I followed him to the consulting room and before I could settle into the chair he turned to me and with a very sympathetic voice announced that it had not healed as anticipated. The radius bone had slipped back down and the fractured piece of bone from the end had repositioned, it was not longer where it had been four weeks previous when it all looked so well. I was gutted… and tentatively asked what was going to happen next. The answer is simple, though not comforting, nobody can really tell immediately. What’s needed is time and rehabilitation to see what the impact will be. The surgeon said that x-rays could show one thing, but my body through rehabilitation could do something else, which means the prospect of surgery is now postponed for three months. It was recommended early on by my surgeon that I’d need a specialist hand therapist, not a regular physiotherapist, as the nature of human hands is complex and it’s important to get injuries treated correctly. I’d already auditioned a few by email and phone, chosen two I liked and essentially went with who could see me as-soon-as-possible for assessment. The prospect of the assessment was beginning to concern me, for I’d been living a few days without the cast, my movement was restricted, if I moved my hand too quickly the pain was awful and I even managed to accidentally bang my wrist against the kitchen bench… cue swearing and pain… oh the pain! My fear was that the fact the bones had not healed in place as expected that I’d be in for a painful and fruitless rehab. My fears have since turned out to be more in my mind than reality, as the assessment has shown that I have more movement available than I expected and following my exercises, swelling is beginning to reduce and there is more movement and strength each day, however it’s far more incremental than I thought it would be and riding my bike is at least three weeks away, if not four. I’ll not lie, I have really come close to trying, though it was an easily dismissed idea when I found I could not use my hand to control the brake lever… and on that, I’ll finish, as I need to go do some exercises and then have some rest.